As B&T reported on Tuesday, Apple has unveiled plans for its new iPhone 8 that will be revealed to the world on September the 12th (although they’re not expected in Aussie Apple Stores until later in the month). According to reports on a number of tech websites, Apple will launch three different versions of the phone, including updated versions of the two iPhone 7 models and a “signature” larger (and apparently rather expensive) version to celebrate the iPhone’s tenth birthday. 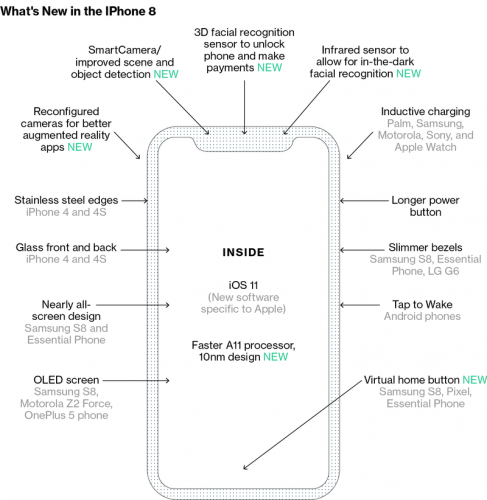 The base model iPhone 8 will reportedly cost $US850 ($A1070); however, no pricing has yet been revealed for the Australian market. According to Apple’s earnings report from February, the company had expected to sell close to 80 million iPhone 7s and it would have hopes of bettering that with the 8 model. However, it appears someone’s actually got a model in their hands, with US business site Bloomberg Technology reporting the new model will come with new gesture controls to replace the home button, a taller screen with rounded corners, facial recognition technology and a brand new screen and camera. The new model’s overall size will be similar to that of the iPhone 7, but it will include an OLED screen that is slightly bigger than that of the iPhone 7 Plus (14 centimetres). Apple also plans to include a stainless steel band around the phone which the glass curves into. The steel band has small antenna cuts on the corners like past iPhones to improve reception, Bloomberg reported.